Wind energy is one of the safest and cleanest sources of alternative energies that are currently receiving worldwide attention. After burning fingers for generations by generating electricity through fossil fuel that have polluted the environment tremendously, we have now learnt that this God-sent form of energy can at last provide electricity without emitting greenhouse gases and polluting the air that we breathe. Amazingly enough, we have been using wind energy since ages by utilizing its force to propel sailing ships and grinding corn through windmills without ever having an idea that this energy could also deliver electricity, if appropriately harnessed. Safe and clean wind energy incidentally is also a form of solar energy. Hypothetically speaking, if the earth is considered to be its mother, the sun appears to be its geophysical father. As the sunrays hit the earth that consist of various terrains; some high others low, cool valleys and dry deserts as also mighty rivers and the seven seas, each area or surface of the earth gets unequally heated. When a particular zone or area gets more heated up than its surrounding zone, the air resting above it loses its density and goes up, creating low air pressure there. But nature never allows a void and so cooler air surrounding the low pressure zone rushes in to fill the void. This is one of the reasons how wind gets its energy or force that may turn into a gale. Wind also gains its force or energy due to the earth’s own rotation on its axis when the air immediately above it starts rotating too. But since the air higher up the sky is not affected by this rotation, there forms a clash between the two forms of wind, as a result of which a tornado or a typhoon is formed. Nevertheless, people had long been toying with the idea of creating current through wind energy for several decades. Today, many homes in US cities or suburbs use wind turbines to create electricity and this also reduces their utility power bills substantially. Moreover, small rooftop turbines are also selling like hot cakes in many towns and cities. These turbines are cost effective on the one hand while their installation is subsidized in many states through rebates, tax credit, etc. What is more, the technology involved in making these small wind turbines is so simple that any person with minimum technical knowledge can build a machine at home. To create a safer and cleaner America, the US government today welcomes investors and private companies to invest money in wind farms that may soon alter the US power generation scenario from fossil fuel burning, CO² emitting power houses to hundreds of green power producing wind farms supplementing power to national grids. The <?xml:namespace prefix = st1 ns = "urn:schemas-microsoft-com:office:smarttags" />Horse Hollow Wind Energy Center in Texas is now considered to be largest wind farm in the world. Fortified in its faith for safe and clean energy, the United States is now forging ahead with installation of offshore wind turbines since sea wind is always there and barricades are almost nil. What is more, people now seem to be responding more enthusiastically to the newly elected US President Barack Obama who declared, “Any governor who’s willing to create clean energy will have a partner in the White House. Any company that’s willing to invest in clean energy will have an ally in Washington.” Three cheers for safe and clean wind energy. Adding wind power to your home is a smart choice indeed. That is because you can finally contribute yourself to clean up the air, and you can also reduce your power bills. 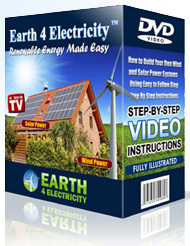 Set up your personal wind power system at home because it is safe and clean energy. And the best news is, it can be done cheap and without any hassles as well. Electric wind power will help you contribute to clean up the air and also reduce your power bills. But before you can make the system work, you need to know where to set it up at the home, how to set it up and wire the system, where to get the parts from cheap and also the safety precautions that need to be followed.